CapMan Nordic Real Estate II fund and Conorin Oy, a company specialised in real estate development, have established a multipurpose properties concept,”Monitoimitilat.fi,” which rents modular and transformable commercial properties in growth centres. The joint venture to establish a portfolio of light industrial multipurpose properties combines CapMan Real Estate’s institutional investor community and Conorin Oy’s experience in real estate development, facility management and brokerage of similar commercial properties. The construction of the first multipurpose properties will begin in February 2019 supported by high tenant demand. The joint venture investment programme is planned to be expanded in the future. 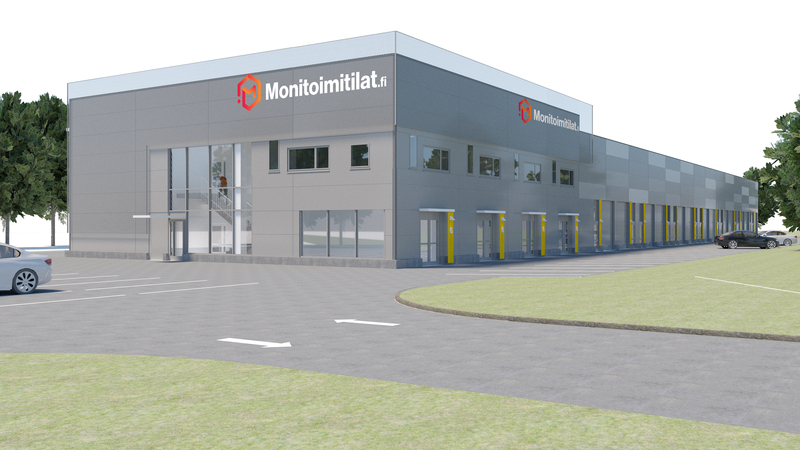 The Monitoimitilat.fi multipurpose property concept (www.monitoimitilat.fi) provides easily transformable and customer-oriented leasable premises to suit the diverse needs of small and medium-sized companies. The planned solutions are adapted for light production, warehousing, maintenance work and office purposes, as well as to be used as e.g. showrooms and retail space. The modular spaces can also be combined depending on customer requirements. Due to their flexibility, the properties are suitable for a wide range of businesses and can be easily customised to suit companies of varying sizes and with different equipment. Spaces range between a few tens and over one thousand square metres. Energy efficiency is also considered in the planning of the modern and stylish premises. The first projects will be constructed in Espoo, Järvenpää and Tuusula in the Helsinki metropolitan area and in Pirkkala, the neighboring municipality of Tampere, and will have a total lettable area of approximately 14,000 m2. The properties will be completed gradually starting from autumn 2019. ”We have noticed that it is challenging for small and medium-sized companies to find modern premises in good locations that are flexible in terms of size and equipment level, as available properties are mostly outdated and impractical. Monitoimitilat.fi delivers solutions for these needs. When planning the properties, we pay particular attention to the attractiveness of the location and to the functionality of the surrounding infrastructure,” comments Juhani Erke, partner at CapMan Real Estate. ”Especially smaller companies wish to house different operations in the same premises, for example production and warehousing in connection with the office. Many construction and maintenance companies, car repair shops and importers of goods have needs for these kinds of flexible premises, just to name a few. We have already good negotiations going on with potential tenants,” says Jani Haarala, CEO at Conorin. CapMan Real Estate and Conorin Oy make the investments through the joint venture Suomen Monitoimitilat Ky, in which Conorin Oy, the original creator of the concept, acts as the operating partner. Suomen Monitoimitilat Ky is reviewing a number of new investment projects in attractive locations in the Helsinki metropolitan area and the investment programme is expected to continue during 2019. CapMan Real Estate’s Nordic team consist of ca. 30 professionals in the field of investment, asset management and property management operating from its offices in Helsinki, Stockholm and Copenhagen. CapMan Real Estate manages assets of ca. €1.9 billion in its real estate funds. The first fund was established in 2005.